Looking back on my graduate school experience I am amazed at how many statistics courses and new methodologies I have learned in such a short time span. Our discipline is constantly evolving as a science with paradigm shifts, new theories, high tech measurement instruments, innovative sampling techniques, and advanced statistical analyses helping us as researchers move the discipline forward to better understand marketing and consumer behavior. It is imperative to have a good understanding of research methods and statistical analyses, but statistics can sometimes come off as overwhelming, complicated, or scare people who consider themselves “not a numbers person.” Well, do not worry. Statistics do not have to be scary. During my time as a doctoral student I have learned to embrace them. Statistics can be fun and exciting when you are able to uncover new information and further our discipline’s understanding. Below are some helpful tips and resources for those of you starting out on your academic journey. One of my professors, Dr. Lisa Harlow, stressed the importance of being able to explain a statistical method in simple terms. I found this helpful in better understanding the fundamentals of the analyses and building on my understanding. For example, in simple terms a regression is a statistical analysis used to make some type of prediction and an ANOVA is trying to see if there are significant differences between groups. There are many helpful texts and resources available. I found Dr. Harlow’s “The Essence of Multivariate Thinking: Basic Themes and Methods” to be helpful in my understanding of several different multivariate analyses and learning how to use structural equation modeling. “Discovering Statistics Using IBM SPSS” by Andy Fields is another resource doctoral students have recommended. Reach out to your advisor or personal mentor; they may have recommendations for texts which help explain statistical methods in layman terms. Having group discussions about class content can be helpful in better understanding materials. During my first semester, I met with a group of my peers to discuss content covered in our univariate statistics class. If you ask around, many of your peers will be interested in meeting to discuss course content. I found it to be a comfortable place to ask questions and share ideas. Additionally, if you get an opportunity to lead a marketing research review session or teach a course, do it. By preparing the material, creating activities, and explaining the content to others, you will help further your understanding of the research concepts and statistical analyses. I am very thankful Dr. Kay Lemon and Dr. Barb Bickart gave me the opportunity to teach marketing research and learn how to explain complex content in simple terms. If something is unclear or you are struggling in class, ask a question. Some courses may have a teaching assistant who is also a graduate student. I found it to be less intimidating asking the TA questions. Use them as a resource to clarify any questions you have. Sometimes the TA has previously gone through the course, so they will have a good idea of what you are going through. My statistics TA, Leslie Brick, did a great job helping out by answering questions, assisting with the statistics software, and explaining how to write up an academic results section. Likely the TA for your statistics course will be eager to help in any of these areas and want to see you succeed in mastering the material covered over the course of the semester to help with your future research projects. Fellow PhD students are another great resource to utilize. Third and fourth year students in your program are available for questions. They can give you real examples of when you would want to use statistical tests based on their past research experiences and projects. Make sure to return the favor when you get to that point in your graduate school career. Searching online you can find some helpful videos explaining how to do different statistical analyses in various software programs. I am one who embraces learning by doing, so I follow along with the video actually doing the analyses. Here are two websites I have previously used (http://www.statisticslectures.com/ and http://thedoctoraljourney.com/) with some free resources and videos to help you use statistical software programs, interpret results, and write up an academic study results section. MOOCs stand for Massive Open Online Classes and are a great resource for someone to simply log-in and start taking a course in an area of interest. There are several MOOC sites. I have previously used Coursera (https://www.coursera.org/) and found it to be a successful option with dozens of statistics courses to choose from. They often have good resources posted on the course site to reference and there is no penalty for not completing the course, so you can get just what you want out of it. There are lots of statistical programs out there (R, SAS, SPSS, Mplus, Amos, LISREL, Stata, JMP, and many more). In our discipline a common software program we use is SPSS. If you are not familiar with it, this would be a good program to purchase and gain some fundamental knowledge with prior to the start of your PhD program. Learning some of the basic functions (inputting data, descriptive statistics, and t-tests) are good to know prior to starting your graduate program. If you are looking for a free software program, R is available online. If you decide to use R, I would recommend using R Studio. It is also free and has a more user friendly interface. You can access R at https://www.r-project.org/. Look at the articles in some of our discipline’s top journals (Journal of Marketing, Journal of Marketing Research, Journal of Consumer Research, and Marketing Science). Skip to the methodology section of the articles and see what statistical analyses these researchers are using. Since many of us strive to publish in these top-tier journals it is good to understand popular research methods and practices currently being used. Do not be afraid to learn new statistical methods you may be unfamiliar with. During our PhD process, this is our opportunity to add more statistical “tools” to our researcher “tool-belt.” If you have the freedom to take elective courses in your program consider adding some methodological classes to your schedule. At this stage you do not want to restrict yourself to limited types of research. For example, by claiming you are an “experimental researcher” you may be limiting yourself to only experimental designs. You may be less likely to learn more complex statistical analyses or could miss out on techniques to use for secondary data. Keep an open-mind and learn as many research methods as possible. You may need them later in your research career. In addition to taking courses within your department, other departments at your university may have helpful courses for your research development. I often found helpful courses in the statistics and psychology departments at my institution. Sometimes your school, doctoral consortiums, or conferences you attend offer helpful workshops or sessions on different research methods. Those can be great opportunities to learn and also network with other professionals in the room. As PhD students we can use statistics to help us better examine the phenomena we are studying. Whenever you are learning about new statistics, apply them to research you are interested in or currently conducting. As a result, these tools will become more useful to you and help in the learning process. Share your resources with others. As you advance through your doctoral programs give back by helping out some of the newer PhD students by answering questions, giving examples, and providing materials which you found helpful in your learning process. By sharing information and content with our marketing community as a whole, we can help advance our discipline by making our learning process more efficient and expanding the number of research methods available. Going into the first statistics class of my PhD program I was intimidated and nervous. We covered some statistical analyses in my undergraduate studies and MBA program, but I knew this would be different. Looking through the course syllabus for the first time, I saw I would be learning to use a new software program and several new statistical techniques. I am very thankful for my study group, course teaching assistant, and the fellow PhD students in my program during the first semester. Talking through some of the statistical methods and concepts with these individuals helped further my understanding and apply the course material to my research interests. The online resources I had mentioned were also helpful supplements in furthering my understanding of the statistics concepts covered. By the end of the semester, I was more confident and looking forward to my upcoming statistics courses. Jim Blair is a third year marketing PhD student at the University of Rhode Island. 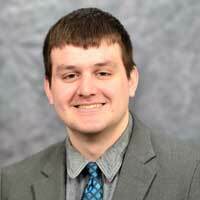 His research interests are in consumer behavior and pricing with previous research in the sport industry. Feel free to email him with any questions at blairj4@my.uri.edu or follow him on Twitter @MrMarketingPhD. This entry was posted in Archived on February 1, 2016 by .